One of my most popular recipes both on my blog and with my friends & family is my Lentil Nut Roast. It goes down a storm with everyone I've made it for and it's got some great feedback from people who have made it themselves. Now, that recipe is undoubtedly amazing but I have a new recipe inspired by that old recipe that may just beat it! Welcome my Nut Roast Bites! I came up with the idea to make these Nut Roast Bites when I was thinking of some quicker, easier free-from Christmas recipe ideas. Nut Roasts are fab but they can be a little time consuming as they take a fair amount of time to cook, but dividing the mixture into a muffin tray cuts the cooking time down considerably! 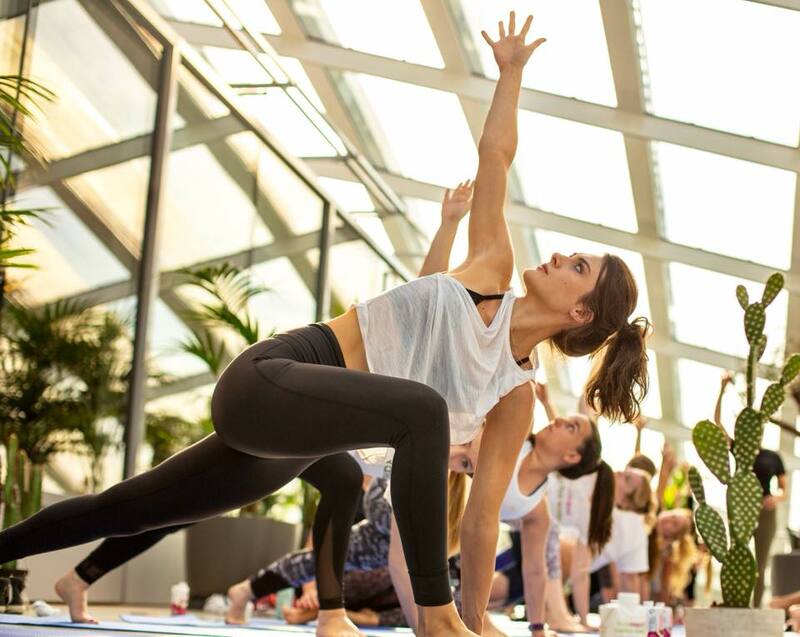 These babies only take 20 minutes max. in the oven! 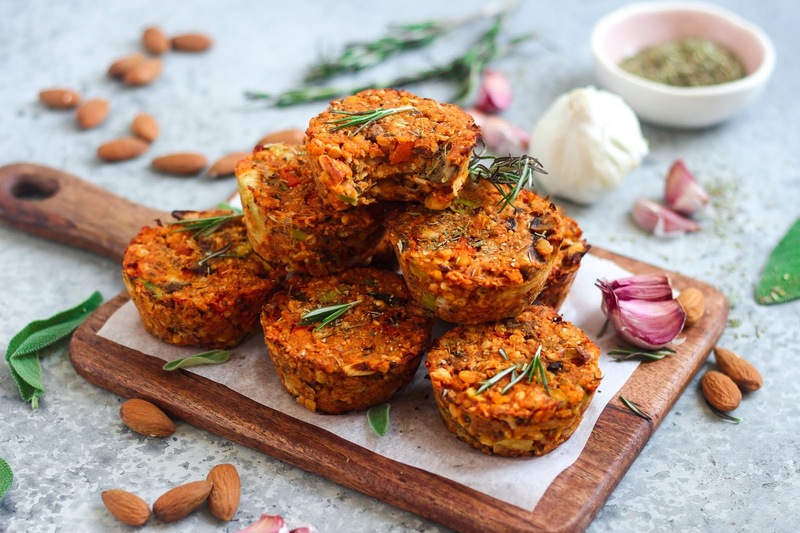 These cute little Nut Roast Bites made with red lentils, cashews, almonds, leeks, mushrooms & herbs are so perfect in every way. Taste wise they're very similar to my classic nut roast but with a few little twists like the addition of fresh rosemary, breadcrumbs and almonds. The fact they're bite-sized means they're just perfect for storing as leftovers, they'll work well on Boxing Day and there's no mess when trying to cut into them (like a nut roast!). I'm just so excited to be able to share this recipe with you. I have no doubt in my mind this is going to be a really popular recipe. I know I'm going to be making it year after year! Christmas wouldn't be Christmas without a delicious feast! Every year we gather around the table with an abundance of incredible food to devour amongst our nearest and dearest. Having been a pescatarian since I was just a little I've always had meat-free Christmas lunches and I'm so excited to see more and more people opting for a veggie Christmas lunch and realising the lack of meat doesn't make the meal any less filling, delicious or indulgent. 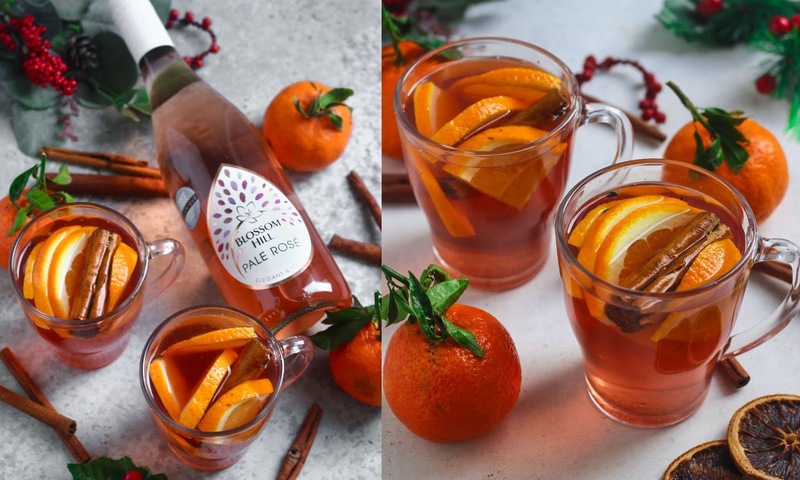 I've had a variety of plant-based Christmas dishes over the years from veggie sausages to nut roast and en croutes to vegan pies, but this year I've made something extra special that will just be perfect for the big day! 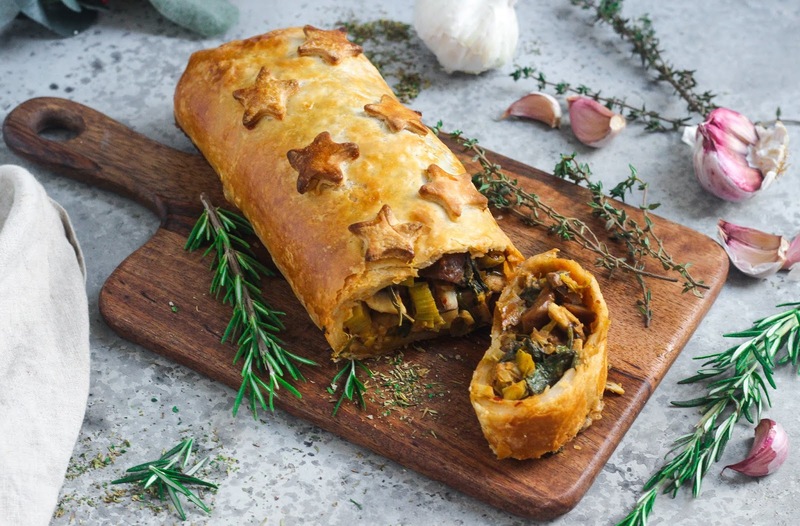 My Mushroom & Chestnut Wellington is the most amazing vegan recipe! It's incredibly filling thanks to the hearty mushrooms and chestnuts, so flavoursome thanks to the fresh rosemary & thyme and pairs perfectly with all the festive sides such as roast potatoes, parsnips, brussels sprouts and of course gravy! You may be thinking this recipe looks a little complicated or time consuming but you'd be very wrong! The recipe is super easy and you can use ready made and rolled puff pastry to make it even easier. I personally used the Jus Rol gluten free & vegan puff pastry which worked splendidly. My boyfriend and I devoured the whole Wellington in just one day, and had zero regrets! It was just so tasty. We snacked on some after I'd finished photographing it then enjoyed the rest in the evening for a full on roast with roasted potatoes, an array of steamed veggies and lots of gravy. Not a mince pie fan? I have just the alternative for you this Christmas! Now, I personally do love a mince pie but I know many people aren't keen on the traditional Christmas treat due to the dried fruits inside. I've come up with this raisin and sultana free pie alternative that will still love you feeling super festive. Welcome Christmas Spice Apple Pies! 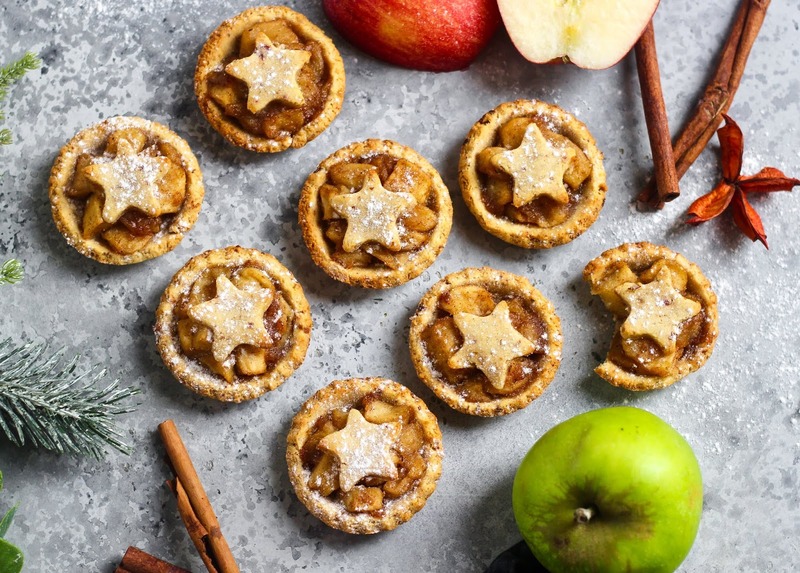 These festive apple pies actually look like mini mince pies, don't they? But the contents is very different! 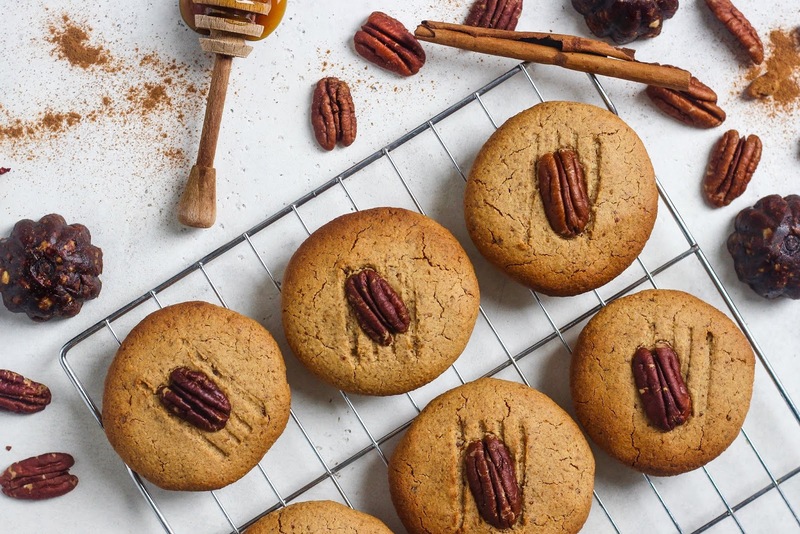 Instead of mincemeat they're filled with cooked apples and plenty of warming spices such as cinnamon and ginger to give that Christmassy flavour. Each pie is packed full of flavour, the gluten free pastry is buttery and soft, the pies are perfect on their own but they're even better with a dollop of dairy free cream or perhaps some coconut yogurt. My boyfriend (who isn't a mince pie) devoured these spiced apple pies, and I scoffed a few myself! I have to say, it was quite nice having a bit of a change to a mince pie! Give the recipe a go, I promise you won't be disappointed.